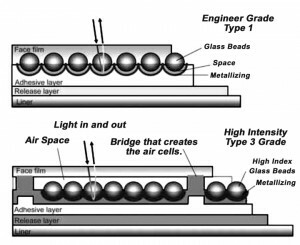 This method of construction applies only to glass bead type reflective films. Enclosed lens is also known as engineer grade (type 1) or super engineer grade (type 2) reflective sheeting. The glass beads provide the reflectivity by bouncing light back to the source. Each glass bead is like a lens. In an enclosed lens film the glass beads are completely surrounded by the flexible polymer that makes up the film. Nothing is able to get to the beads except light. The polymer that surrounds the beads is often tinted which is what creates the different colors. The top part of the image below shows how this works. With this type film you can cut it anywhere you wish and not affect the integrity of the beads. This is why this type film is often used for graphics applications such as letters and numbers on vehicles. Enclosed lens films generally have no visible pattern. Just a smooth color like white, red, green, blue, black, yellow, brown, gold or orange. 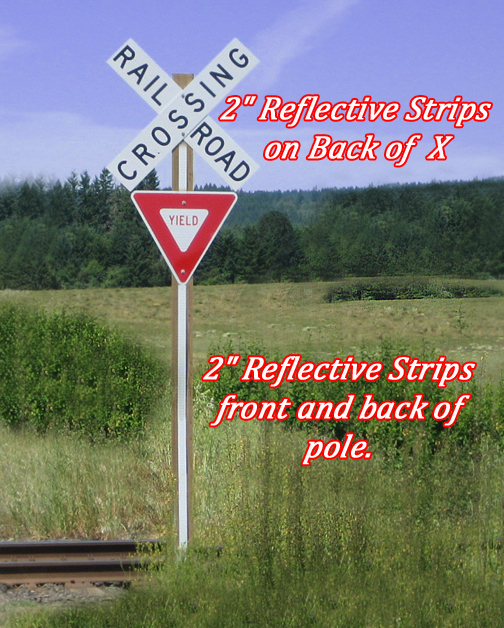 There are several types of reflective sheeting. Engineer grade is the most common and is known as a type 1 film. Super engineer grade is a type 2. High intensity is the brightest glass bead film and is a type 3. The first prismatic film is a type 5. The brightest film is a type 8 and is often called crystal or diamond grade. We have charts on each of the films below. 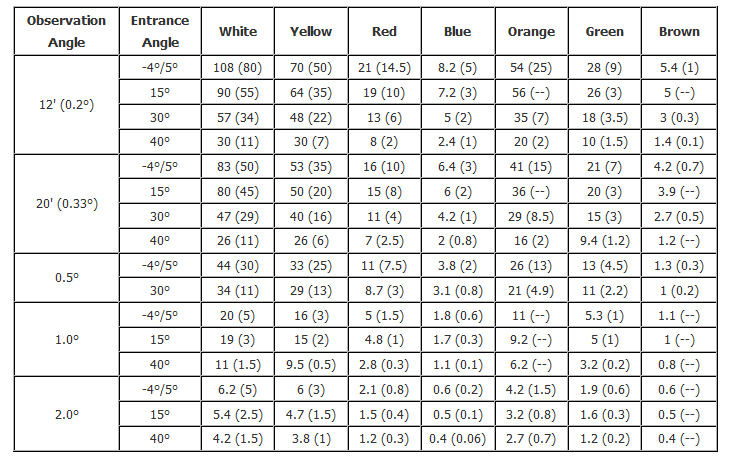 Exact intensities will vary by manufacturer but the charts below are a good guide. 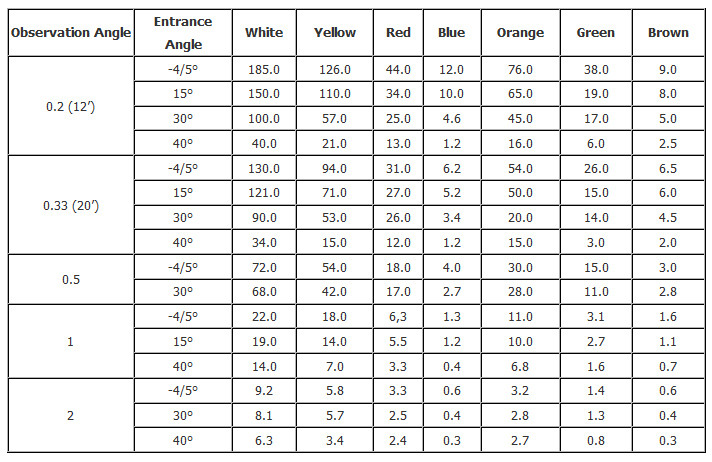 Also, please note that the Type 3 High Intensity chart also defines observation and entrance angles. 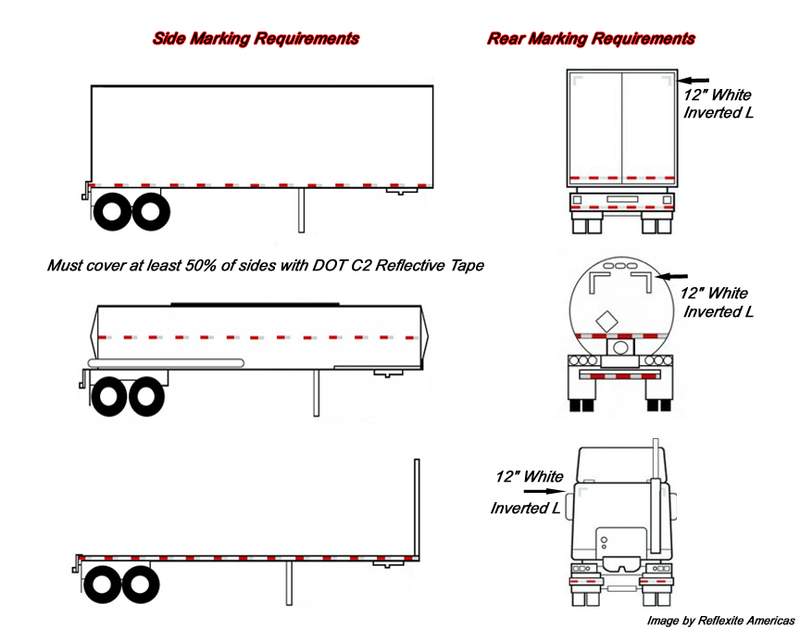 Installing reflective tape is a very simple process. It is basically a peel, stick and press process. However, some preparation must be done beforehand to insure a long lasting application. Adhesive performance depends almost entirely on surface preparation. Before beginning an installation there are a few factors to consider. First, it is up to the installer to determine whether the surface that the tape will be applied to is able to accept adhesive type tapes. For example, some plastics are non stick and difficult to apply to. Also, rough surfaces are difficult to apply to because the tape does not touch the entire surface. Second, newly painted surfaces should fully cure before tape is applied. Otherwise the gases from the curing paint will deteriorate the adhesive and cause the application to fail. Third, do not apply tape in freezing weather or allow the tape to freeze. This will damage the adhesive. Once installed, the tape needs to cure for at least 48 hours before it is subjected to sub zero temperatures. The surface should be clean and dry and it should be dry outside. Do not apply in the rain or moist environments. A sunny day is optimal. Air temperature should be between 32 and 100 degrees. Also, it helps to apply a small piece first as practice. The surface that the tape will be placed on needs to be clean, dry and free of any contaminants such as dirt, grease, oil, etc.. Hand washing the application area with soap and water will accomplish this. Also, to insure that the area is clean, a cloth soaked in isopropol alcohol can be used to wipe the surface down. Before the alcohol dries wipe it down again with a separate rag. This will also help dry the surface and will insure that the adhesive on the tape is able to penetrate the surface and form a good bond. Peel the backing off the the material as you apply it. Do not peel off more than you can work with at one time and do not let it stick to itself. Also, avoid touching the adhesive side of the tape since the oils on your hands can contaminate the adhesive and reduce its effectiveness. Lay the material down using your fingers to press it onto the surface. Try to avoid laying the tape down and then pulling it up and laying it down again since this tends to degrade the adhesive. 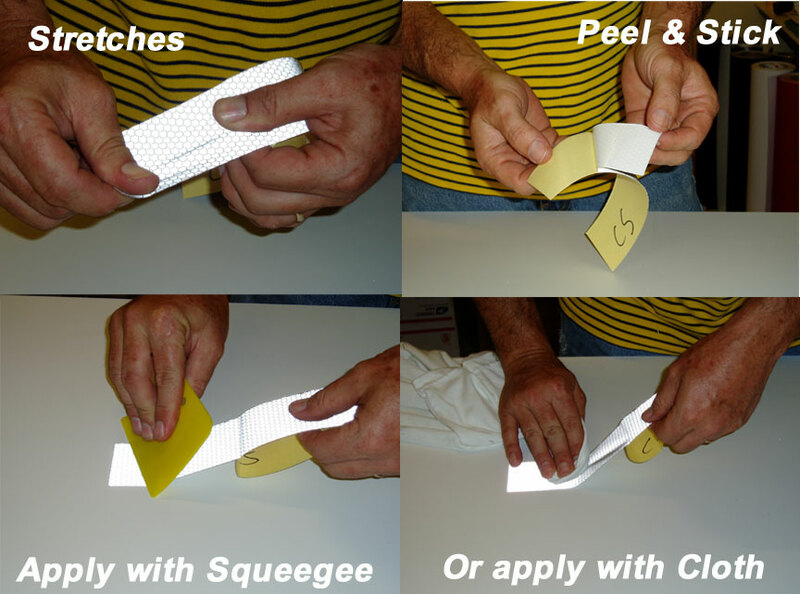 TIP- We have a picture below of a hinge application method that can help keep the tape straight during application. Using a squeegee or similar object, press the tape onto the surface. Gently at first and then with more pressure. This will force the adhesive into the pores of the surface. If neccessary, wrap the squeegee in cloth to keep from scratching the material. If a squeegee is not available use a cloth to press the tape firmly to the surface. When you come to a seam, cut the material with a razor blade. Go over rivets and then after application cut around the rivets with a razor blade or exacto so that the material lays flat all the way around the rivet. NOTE – Our flexible engineer grade will conform over the rivets in most cases. Our Flexible Engineer Grade and Flexible High Intensity tapes WILL go around corners and fold around the edges of doors, however, our other reflective tapes are stiffer and WILL NOT stretch and are not designed to wrap around sharp corners or be folded over 90 degree edges. If you go around a sharp corner cut the tape and begin a new piece around the corner. The edges of the tape should be kept about 1/4″ from the edge of the surface that you are working on. If you bend the stiff tapes around a sharp corner they will stick at first but will eventually come up. The material is designed to be applied to generally flat surfaces. As stated before, for complex curves use our Flexible Engineer Grade or Flexible High Intensity Grade Tapes. Special Instructions for Flexible Engineer Grade tape – Application Temperature – 59 – 77 degrees fahrenheit. In this range the tape performs like standard adhesive vinyl. When the temperature is above this range the flexible engineer grade material becomes very soft and pliable. When the temperature is below this range the material becomes stiffer. (The material is designed this way so that if necessary it can be heated with a hair dryer during application to make it conform to complex curves, rivets, etc..) The material can be installed in temperatures above and below the recommended range, however, it is easier to install in the recommended temperature range. If installing outside in hot or cold temperatures it helps to keep the tape inside an air conditioned or heated vehicle until you are ready to install it. In the summer, installing in the shade is helpful and in the winter, installing in direct sun is preferable. Also, we have posted some pictures of how a masking tape hinge can be used to position the tape and apply it. 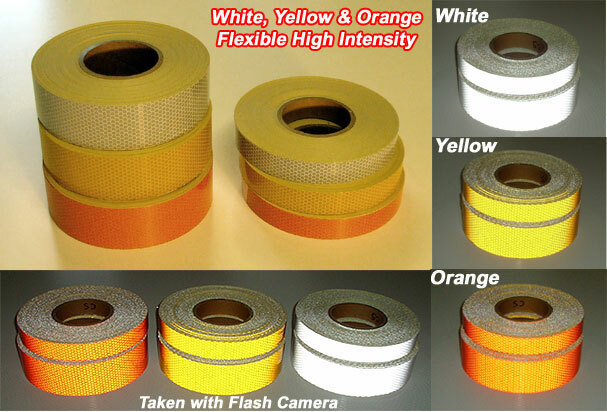 In warmer weather this method will help in the installation of the flexible engineer grade tapes. Service Temperature – Once installed the tape can handle temperatures from -22 to +176 degrees fahrenheit. Some reflective tapes are easier to remove than others. However, the process for removing them is the same. First, heat the tape with a hair dryer or heat gun. If you use a heat gun be careful not to use so much heat that you damage the substrate. As you heat, try to gently peel the tape off. Some tapes will come off whole and some will come off in pieces. You can use a razor blade if you wish but just be careful not to dig into the substrate. If you use a razor blade I recommend you lubricate the area with WD40. Once the tape is removed coat the area with an adhesive remover like Goo Gone or Goof Off. Wipe or scrape off all residue. Then clean with soap and water or any other cleaner. In the US alone there are approximately 137,500 accidents that involve commercial vehicles. To bring this into perspective, every 16 minutes, one person is injured or killed in an accident involving a commercial vehicle. Approximately 50% of these accidents occur in daytime and about 50% occur at night. About 1/3 of these accidents involve rear end collisions. These rear end collisions are what our product addresses. 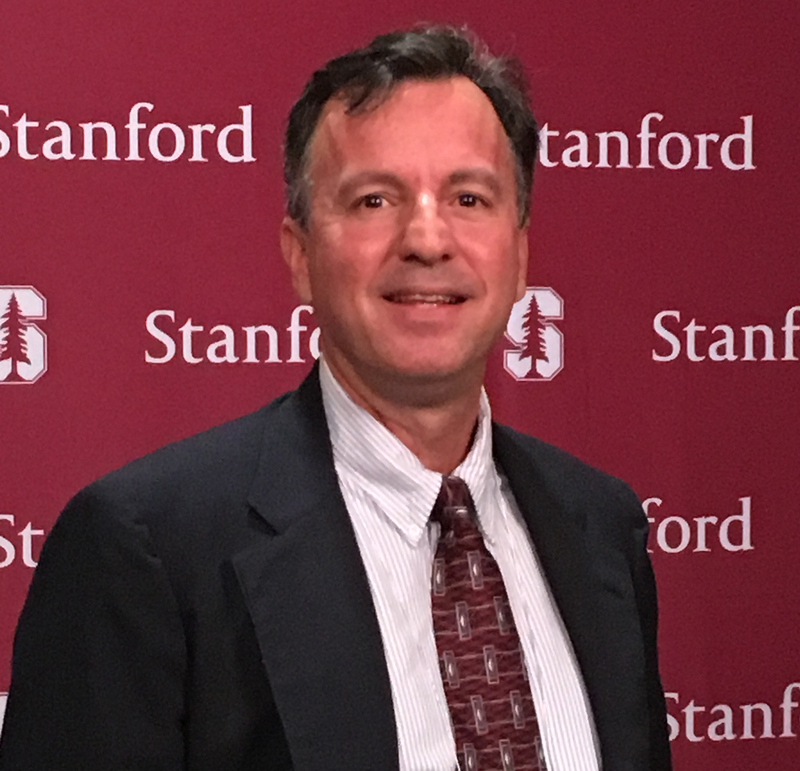 The reason for stressing this particular type of collision is that other types of collisions can be reduced through driver training. However, reducing rear end collisions is a different matter. Rear end collisions occur when a driver does not see a slower or stopped vehicle in front of them in time to stop. Vehicles that make frequent stops in or around moving traffic are especially susceptible to this type of accident. Since most of these vehicles are commercial, the liability associated with collisions can be substantial. Increasing vehicle conspicuity or visibility is the key to reducing these types of accidents. Increased visibility equates to more reaction time which in turn leads to a substantial reduction in collisions. 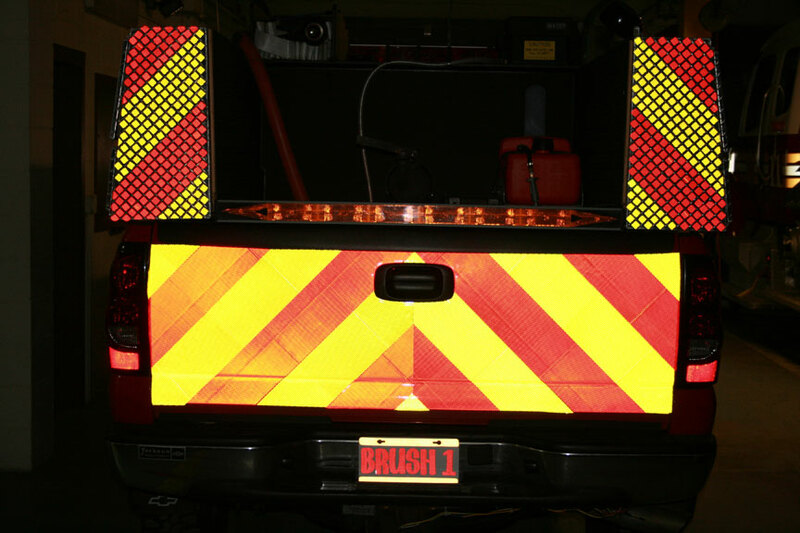 The use of bright, high visibility, reflective tape either in a chevron pattern or in an alternating pattern has been shown to reduce accidents by up to 41%. The effectiveness of this method has been proven in the fire apparatus and emergency vehicle market.